The Fakuma from the 16th to the 20th of October 2018 in Friedrichshafen, Germany, is one of the key events for everyone involved in the plastics industry. The trade fair, which has been taking place regularly for over 30 years, is one of the most important industry get-togethers for people from all plastics technologies – from injection moulding and extrusion to thermoforming. We will be presenting our modular quality management software for the plastics industry at the Fakuma together with the company Multikunststoff from Hamburg. One of the innovations that we will be presenting this year is the latest addition to our vast range of interfaces. 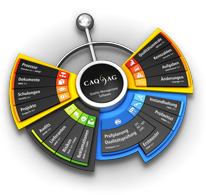 It facilitates the direct interconnection of our CAQ system and the ARBURG ALS master computer system. The Connect.Net interface can hereby directly exchange all process parameters from ARBURG’s electrical, hybrid, and hydraulic injection moulding machines with the CAQ system. Our software solution thereby establishes a direct connection with the ARBURG manufacturing execution system and enables a consistent and uninterrupted quality management workflow. We will gladly present the full spectrum of CAQ.Net® to you personally in an individual presentation. Find out just how effectively CAQ.Net® can assist you and your company in all matters relevant to quality assurance and management in the plastics industry. Simply pop by or let us know in advance what day of the Fakuma you would like to visit us at our exhibition stand 1114 in Halle B1. We look forward to seeing you in Friedrichshafen.